Now, look, I’m no great fan of management B.S. Darwin knows, I have to suffer enough of it in my time. One of the worst aspects was attending professional functions and being asked to “network” with others. That used to be called “building relationships” but no, not now. “Networking” is but one small step away from “running an idea up the flagpole to see who salutes it” or “let’s fly an idea and see if anyone shoots it down”. However, I must say that, when it comes to dragonfly hunting, getting to know like-minded individuals has proved to be most useful. The Internet is not a bad source of Odonata nutters. One such useful Web contact has been a chap called Doug Overton who has an excellent New Forest Dragonflies website. He has a Google map of locations within the New Forest at which he lists the species he has observed. Doug’s the man who introduced us to Tiptoe and a few other spots on a previous New Forest trip. This time, with a specific goal in mind, I scoured his map of sites for new species in which I had a vested interest and made a note of them in my trusty Garmin eTrex h.
One site, Crockford Stream, apparently sports a population of the relatively rare and endangered (it’s on the Red List) Southern Damselfly (Coenagrion mercuriale). In fact, Crockford Stream is famous for them being specifically mentioned in a reference book on the subject, British Dragonflies by Smallshire and Swash. 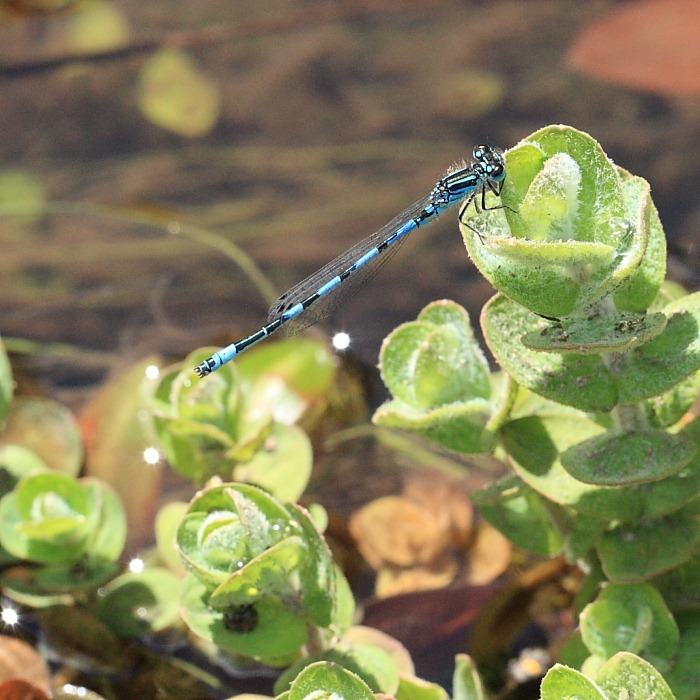 We had visited Crockford Stream on our previous trip but the Southern Damselfly looks like “just another blue damsel” so, in my earlier ignorance, I was likely to have dismissed or glossed over any that I might have seen. After a morning buying supplies, the afternoon seemed like a grand opportunity to go in search of this deceptively common-looking rarity. Clouds were scudding past in what we might generously refer to as being “a stiff breeze”. As we were parking and preparing to set out, even a few rain spots fell out of the scudding clouds and scudded into our windscreen themselves. Actually the wind was quite strong: it was not a great day for Odo spotting. The poor little critters were likely to be hunkered down taking shelter. Enter: hawk-eyed Francine. 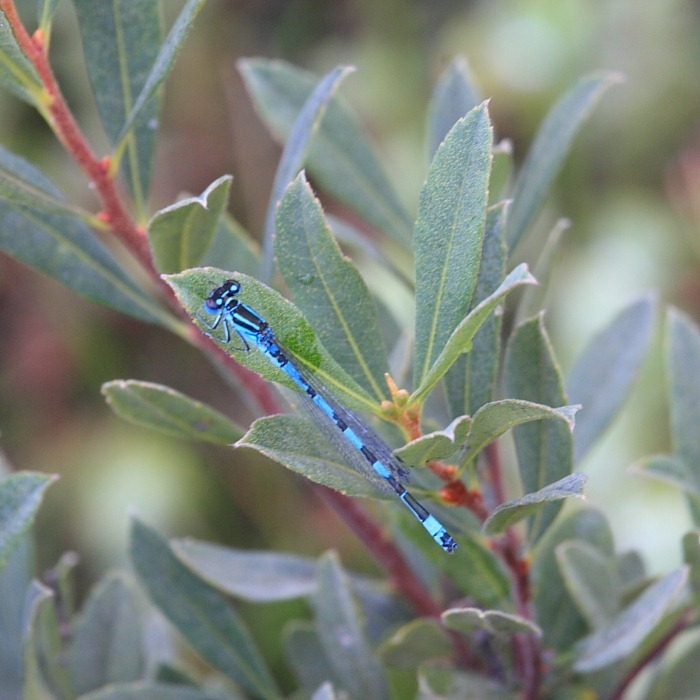 Almost the first thing she spotted was “a blue damsel” hunkered down, as expected, and clinging determinedly to a plant stem in the wind. I stared through the viewfinder. 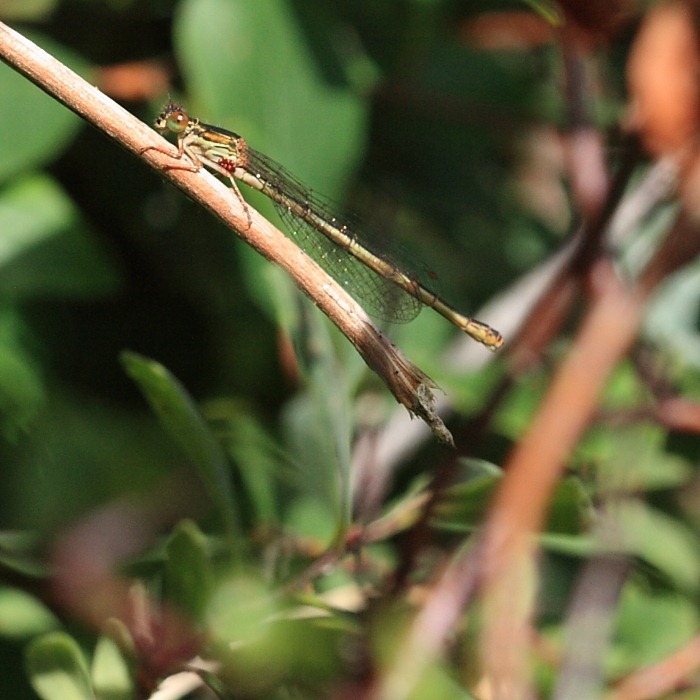 Sure enough, this was a Southern Damselfly. I couldn’t believe our luck but there it was and here he is in all his glory; our very first of his kind. 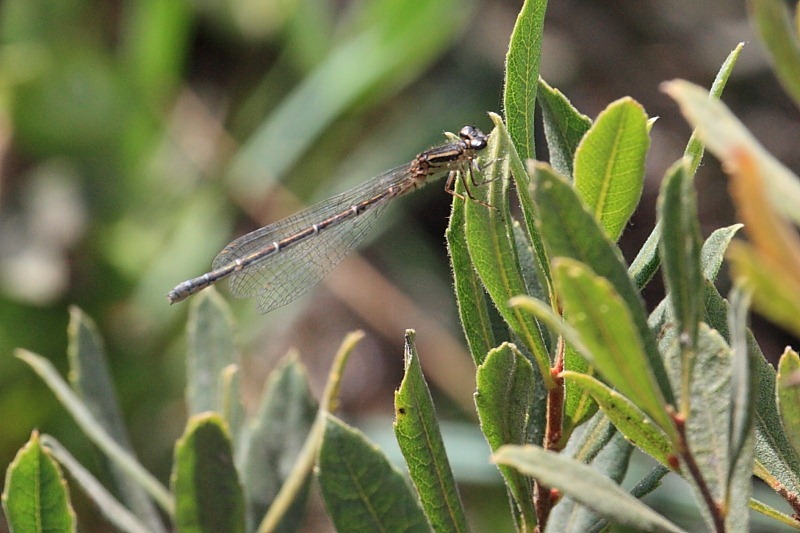 The scientific name of what we term somewhat curiously the Southern Damselfly, C. mercuriale, stems from the black design on segment 2 (S2) of the thorax which is said to resemble the winged helmet of Mercury, the messenger. This first specimen, however, showed very distinct markings with the “wings” of Mercury’s helmet seemingly stuck up above the helmet on a stalk. As the sun put in various appearances between rapidly scudding cloud formations, we saw other individuals and the male here (right) shows the more classic shape with the wings sitting atop Mercury’s helmet. Check out the difference of the markings on the two males. For completeness, on the left is the female of the species, only one of which we saw but old hawk-eyes nabbed it. 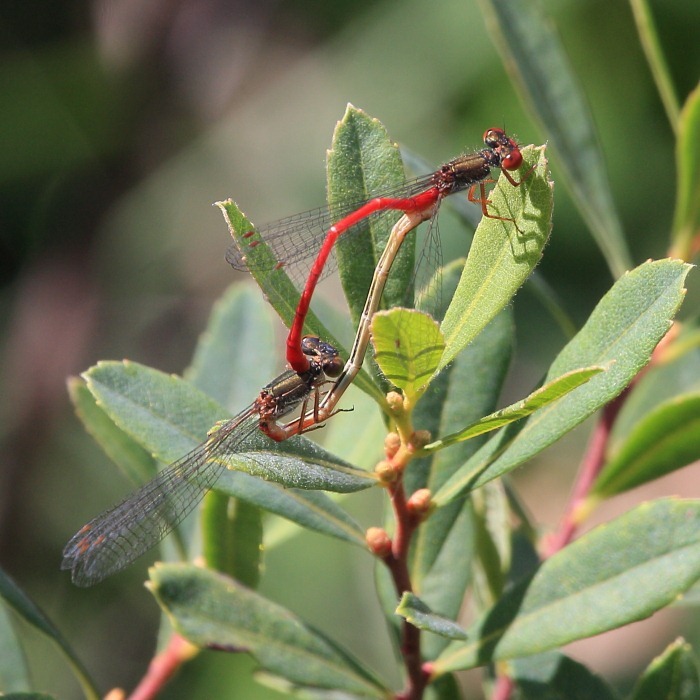 Our book notes that Small Red Damselflies (Ceriagrion tenellum) often coexist with Southern Damselflies and they certainly do at Crockford Stream where we were treated to an in-cop pair (left) and an interesting female (right). If you look at this lady closely, you can see a small cluster of red dots on the side of her thorax. I’ve seen this phenomenon before on a Southern Darter in the south of France but not in the UK. She has a mite infestation, poor thing, and she did seem reticent to move, allowing me to approach close with Francine’s macro lens. Maybe this networking stuff does work, after all.